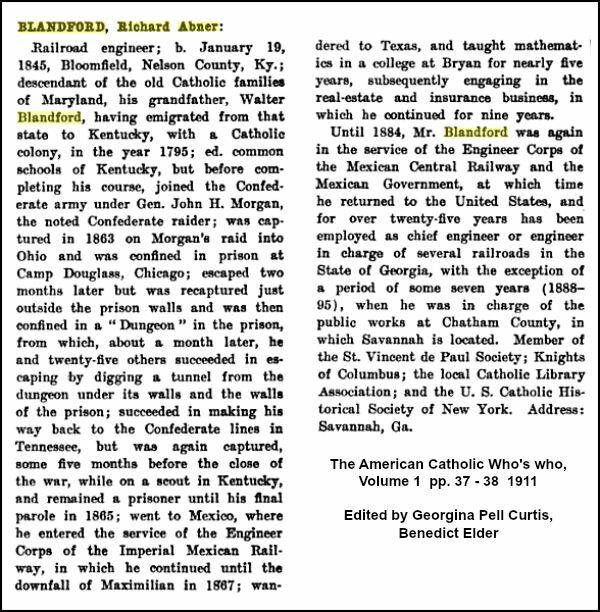 .There is an interesting webpage 'Descendants visit Blandford' that outlines R. A. Blandford's final legacy. He died in 1916 and was buried in an unmarked grave. He had many accomplishments in life as well a tragedy. 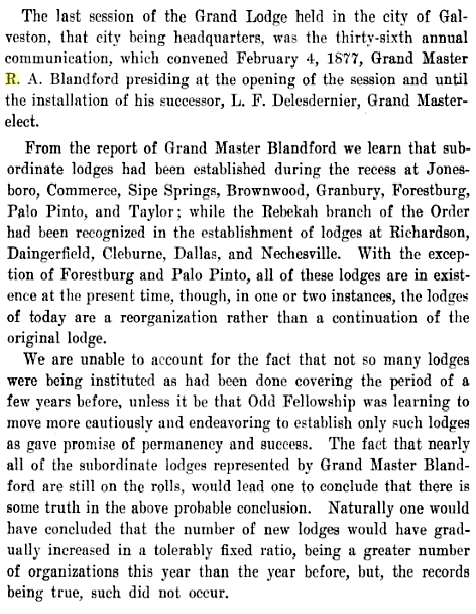 In 1870 R. A. Blandford helped establish the Odd Fellows University in Bryan, Texas. He became the Principal of the school. 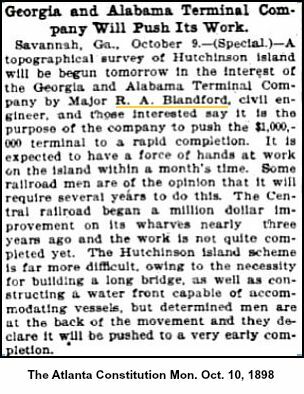 Later on in life he engineered the construction of the railroad from Savannah to Springfield in 1906-07. The most important thing in life is to have made a difference. 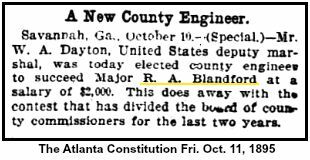 We can say that R. A. Blandford definitely did do that. 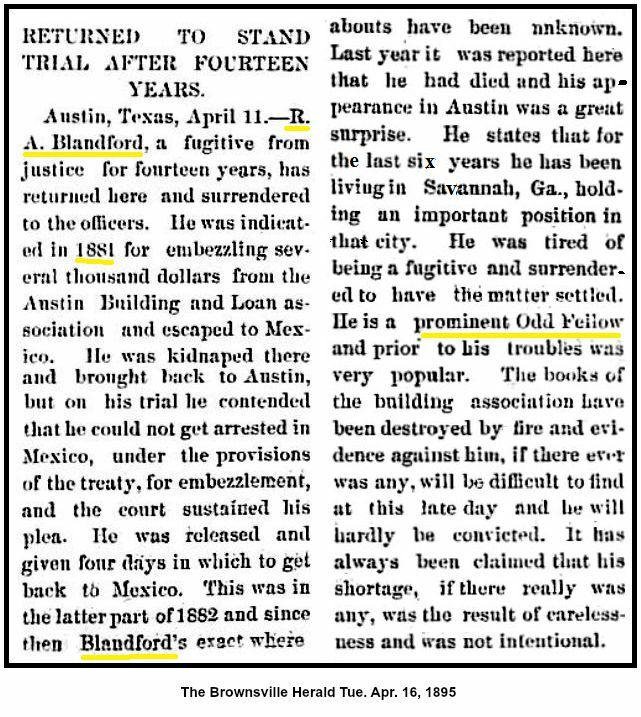 His tragedy had to do with being accused of embezzlement in Austin, Texas during 1881. As to the embezzlement charge, it is believed that he may have used some faulty bookkeeping, or may have inappropriately moved funds between different businesses, but it is not believed he took funds for himself. Richard had three businesses he was juggling at the same time while devoting a lot of time to the I.O.O.F. He went to the national SGL meeting in Baltimore as the Texas I.O.O.F. representative at end of 1879 or early 1880. 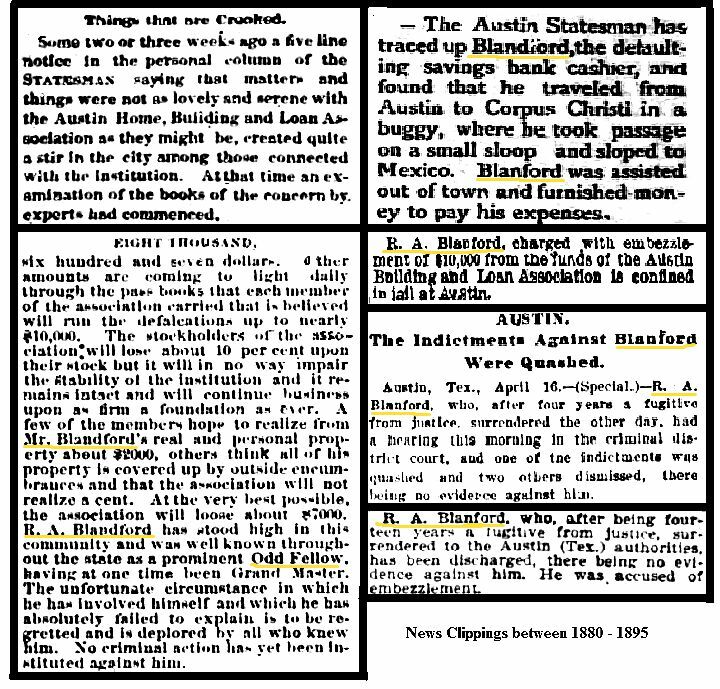 He was an agent for the Widow and Orphans Fund Life Insurance Co., Secretary/Treasurer of the Austin Building and Loan Association, and partner in the Welsh and Blandford Real Estate Co. His wife Rebecca Fisher (daughter of the "Mother of Texas") and three daughters were well into Austin society. But in 1879 his oldest daughter died in a tragic fire accident and his drinking problems intensified. We do not know exactly what happened regarding the embezzlement, but because of the charges and trial, he left his family and fled to Mexico, twice. When he returned in 1895, he was essentially exonerated. He suffered from alcoholism and later in life tuberculosis which finally ended his life. For the final 21 years of his life, he resided in a single room at the Catholic hospital. 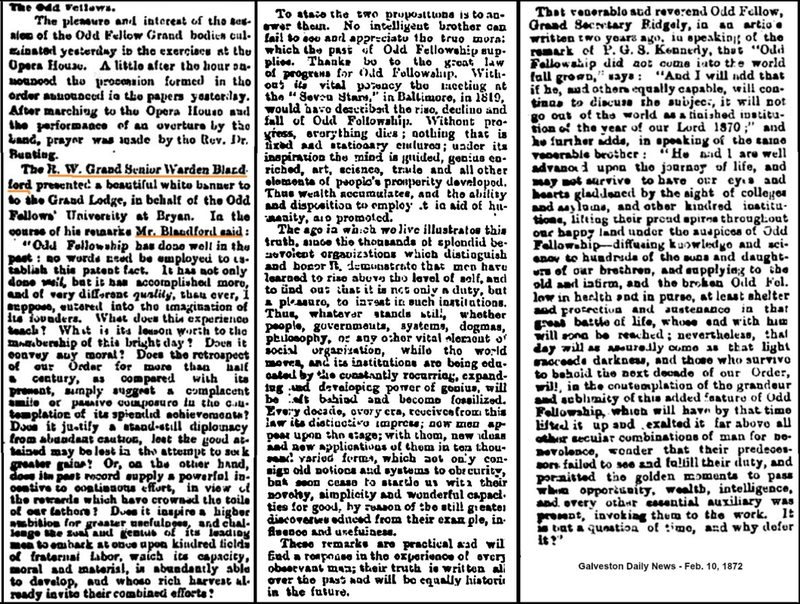 During that time he built railroads and other civil projects. 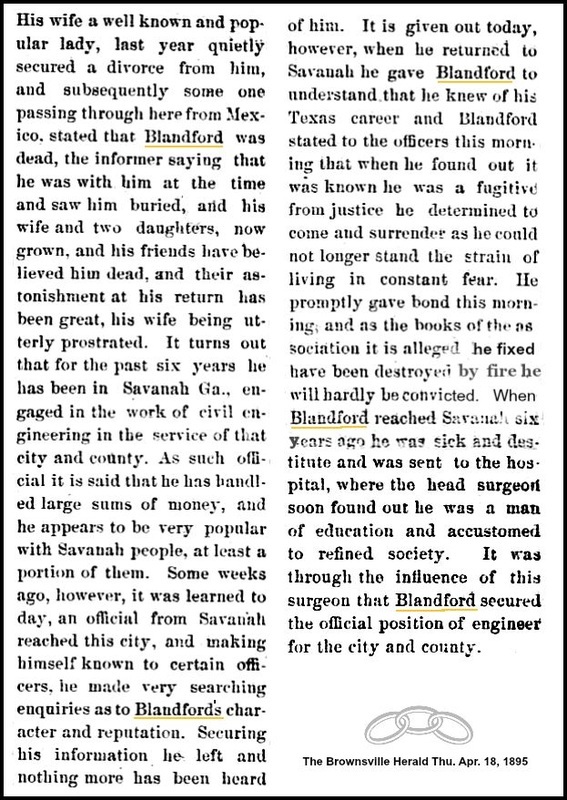 He wrote letters to his two surviving daughters and mailed them books which he had read, but he died alone and destitute with no family in Savannah. He was well respected there, and the six pallbearers at his funeral were among the most prominent Catholics in Savannah. In Savannah he never owned property or accumulated wealth. The Effingham Herald article mentioned on this website tells some of his accomplishments in Savannah. click to enlarge or increase your zoom level.